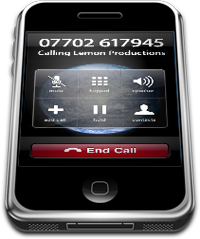 If you'd like to get in touch with Lemon Productions, we are more than happy to talk to you! Even if we cannot provide a solution to your needs, we are often able to point you in the right direction. Please feel free to call us, email a query . If you would like a quote, you can also fill in the form below. How many pages do you expect your site to include? How many pages is your brochure? What size is your brochure?